I’ve always enjoyed writing. Way back when (1988) I won honorable mention for a story I wrote and submitted to a contest held by OWL magazine. My prize an autographed copy of Animalia by Graeme Base. So cool I still have the book in my library. But after that I stopped submitting pieces to editors and/or contests. Then I picked up the first volume of Strange New Worlds. The editors over at pocket books opened up a writing contest to Star Trek fans and they published the winning stories in an anthology! No I did not start submitting stories right away. I was busy mothering a baby girl and then a second one came along. But in 2002 when I had one off in pre-k and getting bored at only being a stay-at-home mom, you guessed it. I was going to give writing and submitting to actual editors a go. I found a SNW (Strange New Worlds) writing critique group online. Filled with want to be, current and previous writers of the anthology. One of those writers was Dayton Ward. I never made it into the Strange New Worlds anthology. But the first year I submitted, I also submitted a creative nonfiction story to a different anthology. To my amazement, joy and a little disbelief, I sold my first story! I continued to submit to Strange New Worlds while it was open. I made the second read pile often, but the best part of my Trek geekiness was the other writers I met in the critique group. Obviously I moved on, and began writing what I know. Who would have thought the advice Beverly Cleary gave in Dear Mr. Henshaw would prove to work. I still kept in touch with Dayton. I even sent him the lecture notes Rachael’s teacher gave his class the last day of school a year ago. My geekiness rubbed off well, because when the teacher asked the name of the ship capable of warp 5, Rachael raised her hand, Enterprise. She recognized the Star Trek universe. The rest of the class… when she was told correct, the class thought the teacher was giving a real history lesson the last day of school. Yes, the subject was history. 😉 never mind the dates on the board haven’t even arrived yet. When I heard Dayton was going to be in Phoenix for the Leprecon, of course I got tickets. Gretchen was excited to meet a real life author. Hello, mom is chopped liver. She even asked if there would be paparazzi following him. The girl met John Barrowman last year sans paparazzi still I was happy she put writers on a pedestal higher than actors. As you can see above, I brought my own paparazzi (aka my hubby). He posted the release of The Great Gatsby Anthology on his Facebook wall and now people want signed copies. Yes, definitely feeling like chopped liver here. 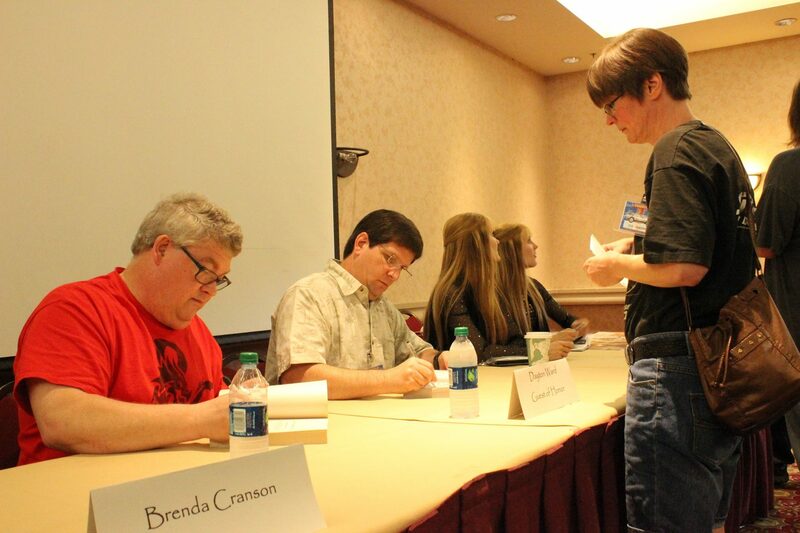 Gretchen met a real life author and didn’t have a thing to ask. She is taking after her mother, starting off writing fan fiction. Shhh… I probably already said too much. It’s been awhile since I’ve posted anything on my blog. Summer break is almost at the midway point here. Rachael only has one more week left of her summer course. Next weekend we will be headed to Leprecon 41. I know I said Gretchen and I would be sitting on our hands until July when we finally get to go out of town, but I’ve been quite busy with my day job. Lots to do as a stay-at-home mom when children are home all day. 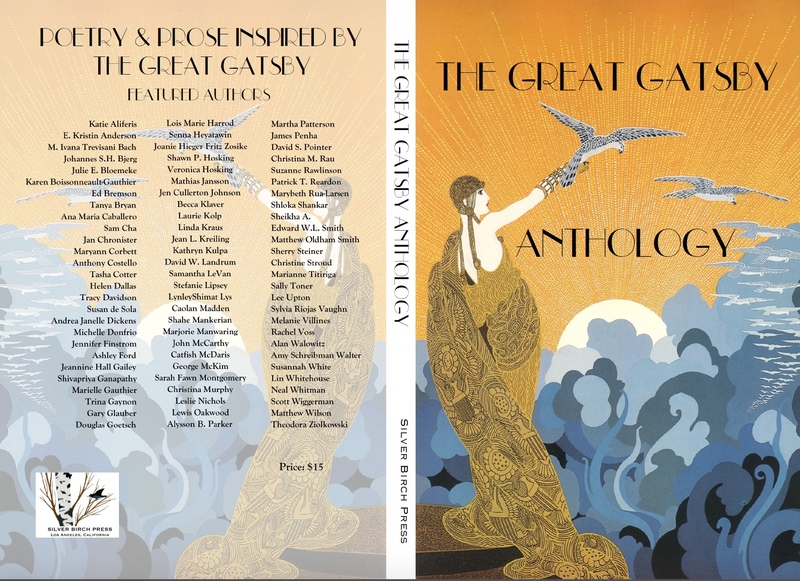 Plus I’ve been proofing pages for The Great Gatsby Anthology. The first one to have a poem by me and my husband. Silver Birch Press has been sending emails for checks and rechecks. And my hubby is amazed at the work involved (not to mention it was almost a year ago since submissions were sent) he is also amazed at the time involved with publishing. I told him, imagine proofing an entire book not just your contribution. Also Silver Birch Press has been publishing some great poetry/photography series in the meantime. I have enjoyed working with them since they published my first piece last July. Back in April I wrote about the Peace Bridge. It was a piece I was working on that happened to fit the napowrimo prompt that day. No, I did not submit to the bridge submission call? Did anyone reading this submit one? 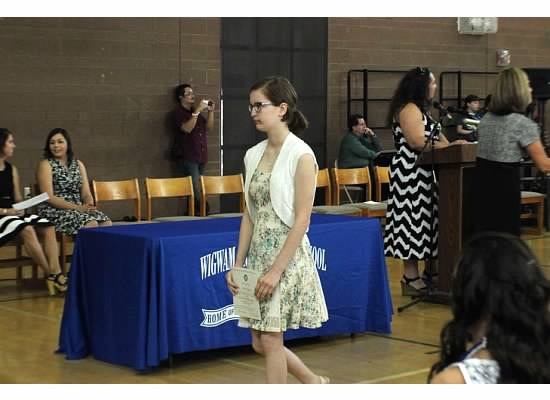 My youngest graduated from 8th grade on May 21st and I did write her a praise poem instead of a letter. The day before, May 20th was Rachael’s 17th birthday. We were scrambling to replace her summer class as the photography one she was enrolled in was cancelled. If you enjoy name acrostics, keep on eye on Silver Birch Press. You could learn how I came across my name.